Kettner Boulevard and West Harbor Dr.
Seaport Village is a charming 14-acre waterfront shopping, dining and entertainment complex. You can also get two hours of free validated parking with any purchase. Fifty yards south of The Fish Market Restaurant is Seaport Village. Celebrating 30 years, Seaport Village is a one-of-a-kind attraction consists of more than 70 fascinating little shops and charming bayside restaurants, live entertainment and beautiful bayfront scenery all in one place. This turn-of-the-century, re-created, waterfront village is ideally located in the heart of downtown San Diego’s Embarcadero at Pacific Highway and West Harbor Drive. Seaport Village is an enchanting recreation of a time gone by. Expect to see street performers as well as friendly face painters and local sketch artists. Seaport Village hosts many festivals, special events, weekend concerts and holiday activities (619-235-4014). Seaport Village is also a favorite viewing spot for the Annual San Diego Bay Parade of Lights in December. All of the shops in Seaport Village are open daily 10 a.m.–9 p.m., and in the summer ( June through August) most store hours are 10 a.m.–10 p.m. The Seaport Village shops are even open on Thanksgiving Day and Christmas Day, 10 a.m.–6 p.m. Fine dining restaurants have extended hours. Credit cards are readily accepted. 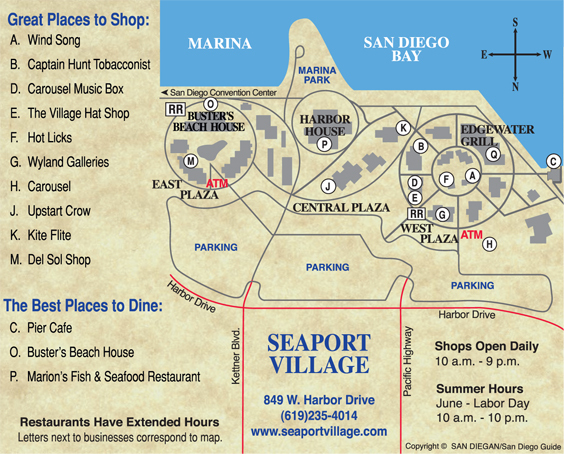 There is also an ATM here at Seaport Village (see map). At Wind Song you can select the perfect sounding wind chime. Many are tuned electronically to specific scales and songs. There are also bells, fountains, mobiles and birdhouses. Also, with a purchase in any Seaport Village store, you can have your parking ticket validated for two hours of free parking. After that there is a fee of ($3) per hour. 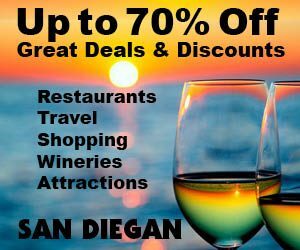 There are so many things to see and do in Seaport Village that the best way to see everything is to start at one end of Seaport Village at 224 Embaradero and stroll through the village. The West Plaza is one of the largest shopping areas at Seaport Village. It includes three excellent restaurants, as well as the food court and the Seaport Village Historic Carousel (see map). The Seaport Village Historic Carousel (H) was built in 1895 and features hand-carved animals by world renowned artist Charles Looff. You can enjoy a ride on this vintage carousel for just ($2). From baseball caps to fedoras to top hats and everything in between, you will find it at The Village Hat Shop (E) (619-233-7236). They also have a location in uptown Hillcrest. If regular hot sauces aren’t hot enough for you, step into Hot Licks (F) (619- 235-4000). They sell the hottest-of-the-hot salsas, sauces and mustards west of the Mississippi River! While in the West Plaza of Seaport Village , visit Wyland Galleries (G) (619-544-9995). It showcases the works of Wyland, the world’s leading environ mental marine life artist. Be sure to take some time to stroll along the boardwalk at Seaport Village. You’ll see Navy vessels and cargo ships steaming in and out of the harbor, as well as the city of Coronado, San Diego Bay and the Coronado Bay Bridge. There are telescopes along the boardwalk so you can get a closer look at these sights. In fact, you can take telephoto pictures simply by placing your camera up to the eyepiece of these 20-power telescopes. An ideal place to pause for refreshments or find an interesting book is at Upstart Crow (J) (619-232-4855). This bookstore also sells coffee, tea, espresso and gourmet pastries. 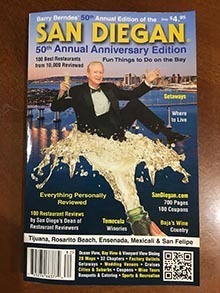 The SAN DIEGAN is also sold here, so if you’re looking for an extra copy, get it here. This bookstore features a wide selection of gifts, cards and 15,000 titles from the classics to the latest best sellers. Another great store a Seaport Village for specialty shopping is Kite Flite (K) (619-234-5483), where you can find high quality kites for all levels of fliers, as well as decorative windmills and windsocks. They also offer free lessons in the Embarcadero Marina Park with the purchase of a stunt kite! Don’t miss Del Sol (M) (619-702-5013) where you’ll be welcomed by their friendly greeters and merchandise. Everything sold here changes color in the sunlight! sunglasses, tote bags, jewelry, watches, Frisbees and more. A big seller is their nail polish, which is one color indoors and a different color in the sunlight. Come in and take home a gift that is fun to wear. Make sure to visit their second location in Old Town. See Shopping. Seaport Village also has award-winning restaurants with romantic bay views. Please refer to the map in this chapter for their locations. Seaport Village is a place to shop and dine and a whole lot more. But it is only one of many attractions, which make the Embarcadero a great discovery. With over 57 places to shop, 4 major restaurants and 13 sidewalk eateries, Seaport Village has everything imaginable. Clothing for women, men and kids. Souvenirs, art, toys, gifts for others, gifts for yourself, you name it Seaport Village has it. Here at Seaport Village is also a lagoon, a 1890s Looff carousel, a marina and much more at Pacific Highway and West Harbor Dr. by the Embarcadero in Downtown San Diego.